Former five division world champion Floyd Mayweather Jr. and UFC star Conor McGregor will finally settle their differences in Las Vegas on Saturday night at the T-Mobile Arena in Las Vegas. The trash-talking on both sides has been intense in the weeks since the fight was announced, with expletives, slurs and more flung by both fighters. Such a blockbuster event has naturally set tongues wagging elsewhere, however. 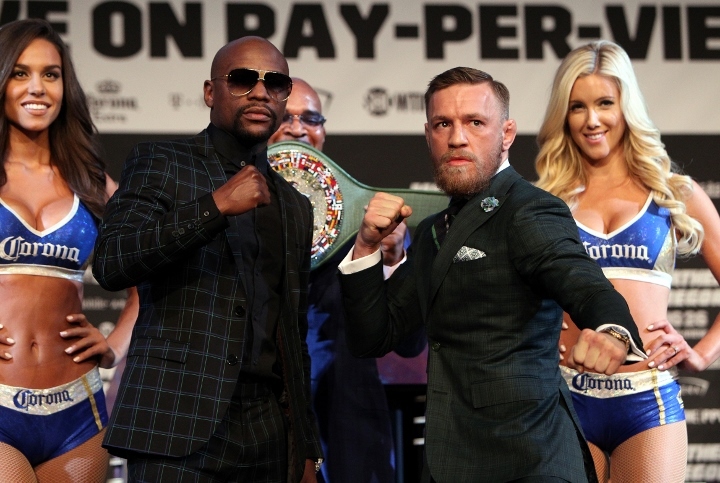 Here we round up what some of the biggest names in boxing and MMA have had to say about the $100 million megafight. "A boxer has no chance in a MMA fight," the former heavyweight king told DAZN. "Okay he has very little chance, not no chance. Just as a MMA fighter has only a few chances in a boxing fight. That's why I am surprised that McGregor agreed to fight with boxing rules and will challenge Floyd Mayweather as a boxer, not as an MMA fighter." Six-weight champion De La Hoya told Omnisport: "McGregor has never fought a boxer, ever in his life. It's a whole different sport. When you cannot kick, when you cannot clinch, when you cannot do the arm bar, when you cannot choke somebody out and you can only punch, it's a whole different sport, it's a whole different discipline. "You cannot be calling out a top fighter in boxing right off the bat. I mean for instance it took me 20 years to win 10 world titles in six different weight classes." "Can Conor McGregor beat Floyd Mayweather in a boxing match? Not a hope in hell, in my opinion," former WBC cruiserweight belt-holder Bellew told Omnisport. "Our sport is being shown so little respect that people believe that this man can just come in from a completely different sport and beat the greatest fighter of our era. "But because it's Conor McGregor and the way he speaks, the way he announces himself, the presence he's got … he's possibly the fastest-growing sportsman in the world I have seen in my lifetime. I have never seen a rapid rise like it in my life. It will be the biggest sporting achievement of any sport ever if he manages to pull this off." UFC knockout artist Manuwa told Omnisport: "His [McGregor's] fights go to show, he'll hit anyone and they'll go down. That's with four-ounce gloves and everything. "He's totally focused, he's totally in the [zone]. He's a workaholic. "He hits very hard I think. If he catches Mayweather then there's going to be problems. "I think McGregor stops him early in the first three rounds." "You know, one thing about fighting is it's really unpredictable anything could happen in there. So, I'm excited to watch it," Ronda Rousey's conqueror Holm told Omnisport. "I feel like it's going to be something that's always going to be intriguing for people. They want to, you know, follow whatever it is. So there might be more crossovers in the future, we'll see." Going against all common sense and boxing logic with likely egg on face afterwards, but the prediction is the most unexpected result: McGregor batters Mayweather and wins either tko or points as Floyd looks old in the ring.